Wow that was a busy few days for me, a busy day at my "paid" employment, a trip to Bluewater, and a team training event but I'm back with card number 3 of my "Remarkable You" set....and the return of those hand cut leaves! This card is made from a sheet of Crumb Cake A4 Cardstock measuring 4, 1/8" x 11,1/2", scored and folded at 5,3/4". The purple layer is a piece of Rich Razzleberry Cardstock. To create the background, I have stamped the leaf image from the Remarkable You Stamp Set (available in Wood Mount and Clear Mount options) using Old Olive Classic Stampin' Pad. I have edged the Very Vanilla Cardstock using ink from a Crumb Cake Classic Stampin' Pad and a Sponge Dauber. I have then drawn a free-hand line around the edge using a journalling pen. 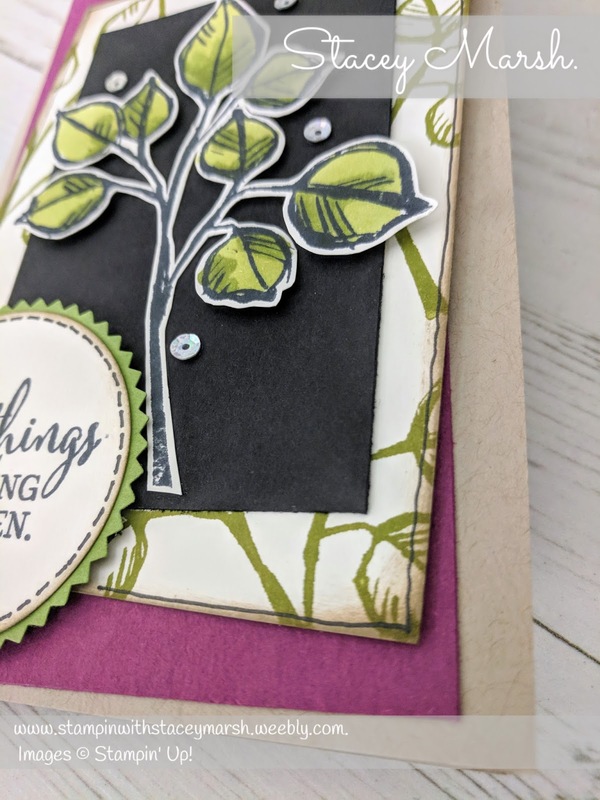 The additional leaf has been stamped using a Tuxedo Black Memento Ink Pad and coloured in using the two Old Olive Stampin' Blends. I have carefully cut the leaf image out using scissors and attached to the Basic Black Cardstock layer using Mini Stampin' Dimensionals. 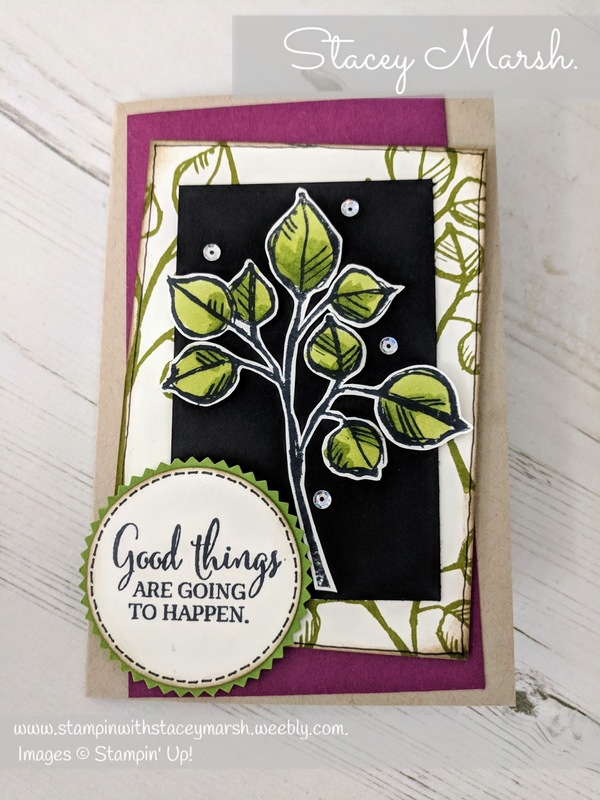 The "Good Things Are Going To Happen" sentiment comes from the You've Got This Stamp Set (available in Wood and Clear Mount options) and has been stamped onto Very Vanilla Cardstock using a Tuxedo Black Memento Ink Pad. I have punched this out using a 2" Circle Punch, and added some Crumb Cake edging with some free-hand stitching using a journaling pen again. Using the Starburst Punch, I have cut a piece of Old Olive Cardstock and layered this with the sentiment, attaching to the card using Stampin' Dimensionals. To finish, I have added some sequins from the Metallic Sequin Assortment. Thanks so much for reading, I would love to know which one is your favourite from the set so far, 1, 2 or 3? ?